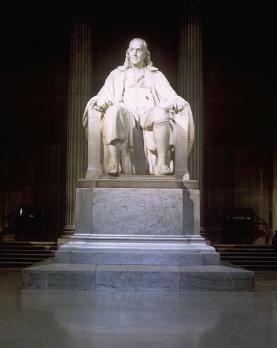 Benjamin Franklin (1706-1790) was not only a scientist, but also an engineer. More than a decade before James Watt invented his improved steam engine and launched the industrial revolution in England, Benjamin Franklin devised a working electric motor. Electrical technology in Franklin's day consisted mainly of scientific instruments. 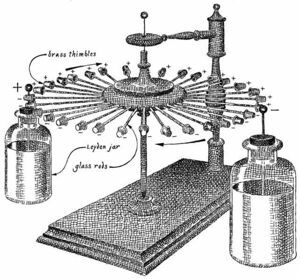 By 1745, electrical scientists exploring the nature of the "sublime fluid" had developed crude electrostatic generators and an early form of the capacitor, which they called the "Leyden jar." Experimenters employed these new devices to explore how electricity could be generated, stored and transmitted, but made little practical application of their knowledge. Franklin developed an interest in electricity in 1747 after receiving an "electric tube" from a friend. Over the next few years, he conducted experiments sporadically and collected examples of the latest electrical instruments. Like other scientists, he explored the ability of various materials to accumulate charges and the curious attractions or repulsions these charged bodies had for each other. However, he also sought more productive use of his findings. In 1748, he invented the "electric wheel." Franklin's machine consisted of a vertical shaft that was free to rotate, from which several glass bars extended like spokes. Each bar was tipped with a brass thimble. Placing the terminal of a "negatively charged" (as Franklin understood it) Leyden jar near the wheel allowed the thimble/glass assemblies to act as capacitors; as each assembly charged up, it tended to be repelled from the Leyden jar. A second, "positively charged" jar set nearby had the opposite effect, pulling the spokes toward it. The result was that the wheel would begin to rotate, and it would remain in motion until the charges on the Leyden jars dissipated. Unfortunately, the motor was only strong enough to continue turning at 12 to 15 rpm when loaded with 100 Spanish dollars. Franklin probably suspected that even a full-scale version of his electrostatic motor could not compete with steam engines or water wheels as a practical source of power for industry, though he did suggest it could be used to power a turkey rotisserie. A few others tried to put the wheel to work, including an unknown toymaker who constructed a small, motorized carousel in about 1830 (an example of which resides in the Bakken Museum and Library). Described in Franklin's well-received 1751 book on electricity, the wheel was overshadowed by his other findings, including his famous proposal to use lighting rods to protect houses from damage. Later practitioners found little use for the electrostatic devices invented in the late 18th century. According to historian Michael Schiffer, the invention of the voltaic pile (an early form of battery) in 1800 dampened enthusiasm for electrostatic generators, while the development of the electromagnetic motor by Michael Faraday and others a few years later permanently turned the course of electric motor development away from machines like Franklin's. Thus, Franklin’s electric wheel has faded into obscurity. This page was last edited on 14 December 2015, at 15:32.